“Galaxy” was found in this condition by Fayette Regional Humane Society agents at a Bloomingburg home. Galaxy on the couch with her new brother, Duke. WASHINGTON C.H. 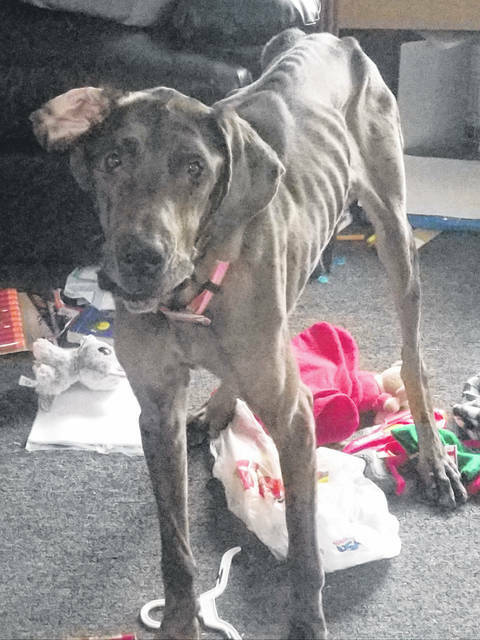 — In the case of a neglected Great Dane, a 28-year-old Bloomingburg woman was sentenced to jail time Tuesday and was ordered to not own any animals for five years. Brittany R. Scott pleaded guilty to a charge of prohibitions concerning companion animals at a pre-trial hearing in Washington C.H. Municipal Court. In addition to her not being able to own an animal for five years, Scott was fined $750 and was sentenced to 90 days in jail. According to the Fayette Regional Humane Society (FRHS), $600 of that fine and the 90-day jail sentence was suspended, provided that Scott doesn’t have any similar offenses for five years. FRHS agents responded to a Bloomingburg home on Jan. 2 after receiving reports from citizens concerned about the welfare of a dog inside of a residence. Humane agents discovered an emaciated Great Dane with her spine, ribs and hipbone being prominent. The dog, named Galaxy, was transported to the FRHS clinic where she weighed only 66 pounds, had internal parasites of round worms, and according to a veterinarian, bilateral entropion with inflammatory change in her eyes. A veterinary technician said that her body was covered in dried urine and feces. Galaxy was nearly 25 pounds underweight for her size, according to FRHS Executive Director Dr. Lee Schrader. Scott reportedly showed humane agents an empty four-pound-bag of dog food that she gave the dog within a week prior to the agents arriving to the property. Galaxy has since been treated for the internal parasites, had surgery to correct the entropion, and has gained the appropriate weight for the Great Dane breed. Galaxy was adopted by her foster parents after she recovered from medical treatment and surgery, according to FRHS. According to North, Galaxy not only shares her new home with him and his wife, but also two other dogs and three cats. 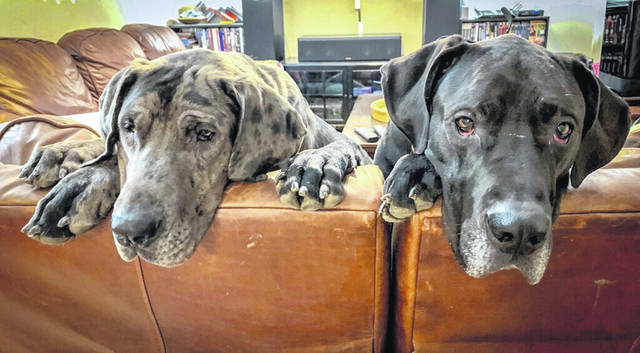 “She is big on snuggles and not just with us, but also Duke, our other Great Dane. Galaxy loves playing outside, running around with the other dogs. She discovered couches make the best beds, not crates. Her favorite thing to do is play with her brother Duke. She is so full of life and energy and loves to play tug with him. When they get tired, she wants nothing more than to climb on a couch and take a nap beside my wife or myself,” added North. Humane agent Nick Marando is happy that Galaxy found a wonderful home. “I am thrilled that she was adopted by a very caring and loving family. The adopters already had a Great Dane and were familiar with the breed, so the adoption was a great match,” said Marando. https://www.wnewsj.com/wp-content/uploads/sites/22/2019/03/web1_20190319_144059.jpg“Galaxy” was found in this condition by Fayette Regional Humane Society agents at a Bloomingburg home. https://www.wnewsj.com/wp-content/uploads/sites/22/2019/03/web1_Galaxyduke.jpgGalaxy on the couch with her new brother, Duke.